Choosing a personality of the year is always difficult due to the fact there are so many who could be the recipient. This year’s winning nomination covers culture, heritage and history through music of a sort and it is the first time that the award will be presented to an establishment as opposed to an individual. The establishment of which we speak has been responsible for the tuition of students in one of Scotland’s most recognised and traditional instruments, the Bagpipes since it 1944. From this time there have been thousands of people from all over the world through their doors all having a passion for playing the instrument. Although there is a team of top quality teachers within the college at the moment there have been others in the history of the college who without their contribution would not have helped the college to be where it is today. The college can also boast of having the only independent museum solely devoted to the great Highland bagpipe. This year’s winner is again undoubtedly worthy of receiving the Crann Tara award due to all the hard work and commitment put in over the years to preserve tradition, culture and heritage. The College of Piping was founded in Glasgow, Scotland, in 1944 by Seamus MacNeill and Thomas Pearston to pass on the art of the Great Highland Bagpipe to all who wanted to learn Scotland's national instrument. As well as teaching, the College's aims were to preserve the heritage of the bagpipe by collecting piping artefacts, manuscripts and memorabilia and by providing a focal point for pipers the world over this still remains the case. College lessons are subsidised by profits from the College Shop which sells instruments, music, Highland wear and bagpipe accessories. A genuine charity, the College often teaches students of low means for free. Since 1948 the College of Piping has published the Piping Times monthly magazine, once described by Captain John MacLellan, former Director of the Army School of Piping at Edinburgh Castle, as the biggest single repository of bagpipe knowledge in the world. The magazine has a current worldwide readership estimated in 2011 at 10,000. Seumas MacNeill was its editor from 1948 to 1996, being followed by Dugald MacNeill and since 1999 by Robert Wallace. The PT as it is affectionately known adheres to the highest standards of journalism and is often provocative and fearless in its criticism of what it sees as contrary to the interests of pipers and pipe bands. In 2005 it campaigned successfully to have the World Pipe Band Championships televised by the BBC and three years later fought to save one of the leading pipe bands in the country, the Strathclyde Police Pipe Band, from budget cuts imposed by a new Chief Constable. The College pioneered outreach teaching of the bagpipe when, in the early 1950s, Seumas MacNeill established schools of piping in the Highlands of Scotland and in North America. This undoubtedly led to an upsurge of interest in Scottish bagpiping on that continent and in no small way contributed to the high standard of piping in Canada and the United States currently enjoyed there. The work continued and in 2007 the College established the first outreach teaching school on the European mainland when it launched its Winter School in northern Germany in association with the Pipers corner Shop at Bruggen. This school has since relocated to Homburg in Saarland. The College has two annual schools in the US in California and New England in June and July each year. The College of Piping is a registered charity in the United Kingdom. 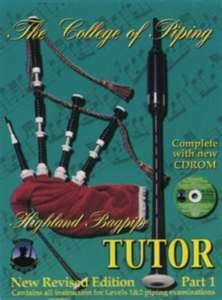 The College publishes and distributes a large selection of tutor books, manuals and historical writings on the bagpipe and its music. Its Tutor Book 1 is the industry standard training manual for the instrument and has sold more than 395,000 copies worldwide. It is the biggest selling piping book in history. It has been translated into Gaelic, French and German with other translations pending. In 2008 the College opened a new Lecture Hall so completing the re-development of its premises and guaranteeing its future for many years to come. The College can now host the most important competitions and concerts in the piping calendar. The College makes no draw on the public purse and survives by the diligence and dedication of its staff and teachers, and the goodwill of the piping fraternity worldwide. It strives to bring Scotland’s national music to all irrespective of means or background – truly a centre of excellence for people the world over. Having recognised the “College of Piping” as worthy recipients of the Crann Tara personality of the year award. The award was gratefully accepted by Dugald MacNeil and was handed over formally at the World Pipe Band Championships at Glasgow Green.